Today I am going to introduce the moustache target distribution (moustarget distribution for brievety). Load some packages first. Let’s invoke the moustarget distribution. This defines a target distribution represented by a SVG file using RShapeTarget. The target probability density function is defined on and is proportional to on the segments described in the SVG files, and decreases exponentially fast to away from the segments. The density function of the moustarget is plotted below, a picture being worth a thousand words. Since we explored some statitics of an abstract painting with Pierre (we even have an article in Variances last issue! ), I became more sensitive to art linked to randomness. Here are some pointers to related websites I have digged out. Day to day data gather together artists who collect, list, database and absurdly analyse the data of everyday life. You can find there links to artists like Abigail Reynolds and her Mount Fear of crimes in London, and many others. 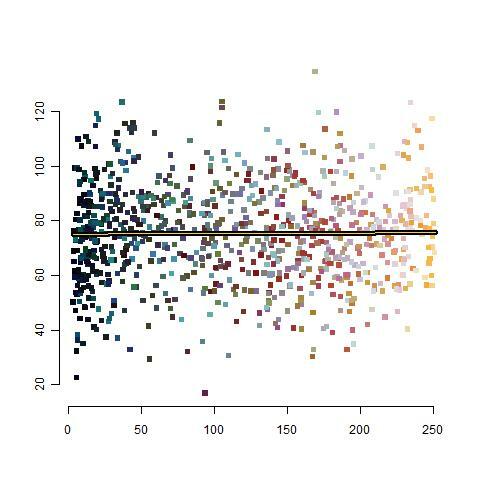 Check the R Graph Gallery if you want to enhance your data visualization in R! The terrain of Mount Fear is generated by data sets relating to the frequency and position of urban crimes. Precise statistics are provided by the police. Each individual incident adds to the height of the model, forming a mountainous terrain. All Mount Fear models are built on the same principals. The imaginative fantasy space seemingly proposed by the scupture is subverted by the hard facts and logic of the criteria that shape it. The object does not describe an ideal other-worldly space separated from lived reality, but conversely describes in relentless detail the actuality of life on the city streets. No mention of the statistical method used (kernel, Dirichlet process density estimation?). Some crime data can be found on UNdata for example, or here for an interactive map. It reminds a great work by David Kahle about crime in Houston, combining ggplot2 and GoogleMap. He won a ggplot2 case study competition for this. His code is available here. I like in particular the contour plot, with cool rainbow colors, where both the crime level and the map background are clearly visible. For a quick recap, Pierre and I supervised a team project at Ensae last year, on a statistical critique of the abstract painting 1024 Colours by painter Gerhard Richter. The four students, Clémence Bonniot, Anne Degrave, Guillaume Roussellet and Astrid Tricaud, did an outstanding job. Here is a selection of graphs and results they produced. 1. As a preliminary descriptive study, the following scatter plots come and complete the triangle plot.The R function , from the package of the same name, displays the pixels with their coordinates in the RGB cube. It shows that, as a joint law, the triplets are somehow concentrated along the black-white diagonal of the cube. The same occurs when the points are projected on the sides of the cube. Here is a comparison with uniform simulations. The points parameterized in these model were projected on the sides as well; here, the sides of the cylinder are to be seen as the circular top (or bottom), the lateral side, and the section of the cylinder by a half-plane from its axis. Its shows that some colors in the hue coordinate (rainbow-like colors) are missing, for instance green or purple. 3. The students built a few ad-hoc tests for uniformity, either following our perspective or on their own. They used a Kolmogorov-Smirnov test, a test, and some entropy based tests. 4. We eventually turned to testing for spatial autocorrelation. In other words, is the color of one cell related to the color of its neighbors (in which case you can predict the neighbors’ colors given one cell), or is it “non informative”? A graphical way to check this is to plot average level of a color coordinate of the neighbors of a pixel with respect to its own coordinate. Then to fit a simple regression on this cloud: if the slope of the regression line is non zero, then there is some correlation, of the sign of the slope. We tried various combinations of coordinates, and different radii for the neighborhood’s definition, with no significant correlation. A (so-called Moran) test quantified this assessment. Here is for example the plot of the average level of red of the eight closer neighbors of each pixel with respect to its level of red. Thanks again to the students for their enthusiasm! Basically it is a kind of alarm clock, with digital figures. But not really the kind of alarm you would like at home, because its digits are random. The 21 tubes of neon light switch on and off randomly (according to the caption: with equiprobability). This makes a bit more than two million different combinations. Out of them, the caption in the museum says that 32 are words (english or french), like SEE, or APE, etc. The odds on this are more than 65 000 to one. When one of these words is picked out, it keeps flashing for five seconds, to make sure you won’t miss it. I have been looking at the piece for only a few seconds. And, of course, I had the occasion to see such a word, the BUS word. It makes me think the draws might be biased, for example to make it more attractive. Or the draws are very quick, but it does not seems so. Any of you knows those neon lights? Well I go back to the Sounds of Silence. Thanks to Pierre, we now have a new playground for saptial stats, see this post. Before that, let’s see if we can see basic stuff without spatial information. We see that the painter has a bias for darker colors, and rather misses light green and light blue ones. So colors are not uniform in the RGB model. There should be a cognitive interpretation out there, no? It is not obvious that human eyes comprehend colors on the same scale as the RGB model does. If not, there is no reason for human sight to comprehend uniformity in the same way as a computer. As Pierre pointed out, what we find in the RGB model might be different in the HSV model.We’ll see this model later. Next step, spatial autocorrelation tests? In this previous post, Julyan presented the paintings of Gerhard Richter, and asked whether the colours were really “randomly chosen”, as claimed by the painter. To answer the question from a statistical point of view (ie whether the colours are uniformly distributed in the (r,g,b) space or in the (x, y, r, g, b) space for instance, where x, y is the position and r, g, b the 3 colour components), we need to extract the data. Let’s take for example the following 1024 colours painting. The data corresponding to this painting would be a 32*32 table, and in each cell of the table there would be a colour, represented for instance by 3 numbers, like in the RGB colour model. Tonight I’ve made a python script that extracts this data, with Julien‘s help. I took the marginal mean colour along both axis and converted it into grey scale. This gives two lines with white segments and grey segments. From that it is easy to find the middle of the segments, which gives the squares’ centres. Once the square centres were found, I simply took the mean colour of a smaller square around each centre. one with 10 colours. R file here, bmp here. one with 192 colours. R file here, bmp here. So now we have the data for three pictures (10, 192 and 1024 colours), and we can start to do some real stats. Are we going to find the same results in the RGB model as in the HSV model for instance ? If not, which colour model should we use? Do you think the colors are positioned randomly or not? Not a trivial question, is it? And you, would you say it is random? This work dates back to 1974, when computer screens mainly displayed green letters on a black background. So it seems the artist did not benefit of computer assistance. There are many ways to interpret this plain English statement into statistic terms. For example, are the colors, with no ordering, uniformly distributed? (OK, this doesn’t mean at all (true) randomness, but this is a question…) It would be nice to have the 256 colors in RGB. In this color model, (0,0,0) is black, and (255,255,255) is white. I think that there are rather more dark colors than light ones, ie more data points near the (0,0,0) vertex than near the opposite one, in the RGB cube. So a test of uniformity would probably be rejected. A more subtle way to interpret uniformity in the painting would be to take into account the position of the colors… Any idea how to check that? I have no clue.